Simplix is a super-personal theme that focuses on you: the blog owner. Due to the Lifestream function, which allows to connect social resources to your blog and make it alive and interesting. 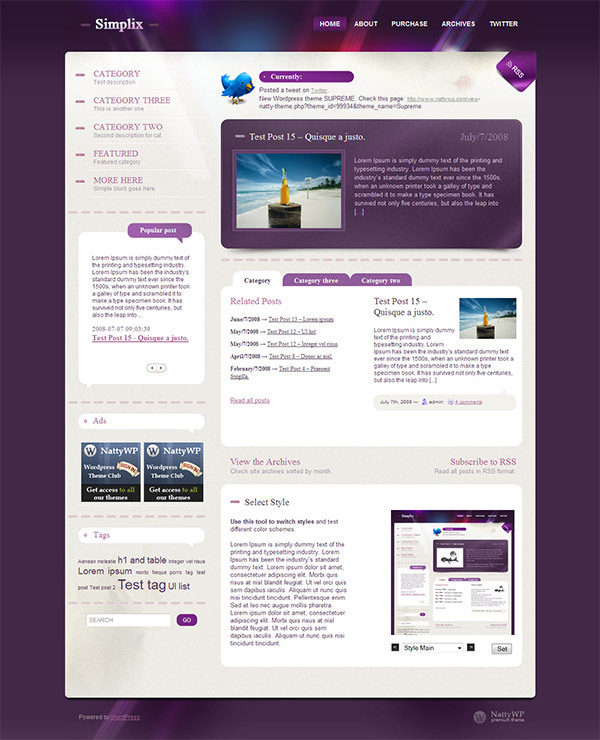 The theme also includes a custom widgets for banner advertising. The Simplix theme features an AJAXed Latest news module, Advanced categories tabber to emphasize your most important posts, so choosing each category you may read the latest and related posts, a completely widgetized sidebar and footer with custom widgets included in the theme package, popular post module with scroll feature shows the most commented articles across the blog, lifestream module for Twitter updates, 7 custom NattyWP widgets and 4 different styles to choose from. You also get SEO Optimised Layout with custom SEO settings with the ability to optimize each post, automatic image resizer, which is used to dynamically create the thumbnails for the blog posts, site statistics and more.